"With a history of 75-plus years in this industry, we are proud to take part in America Recycles Day, which recognizes the importance of our business. Recycling is such a vital component in the health of both the environment and U.S. economy. We hope generations to come continue to realize the importance of recycling, and continue to advance the industry as a whole," said Randy S. Miller, President of Miller Recycling. 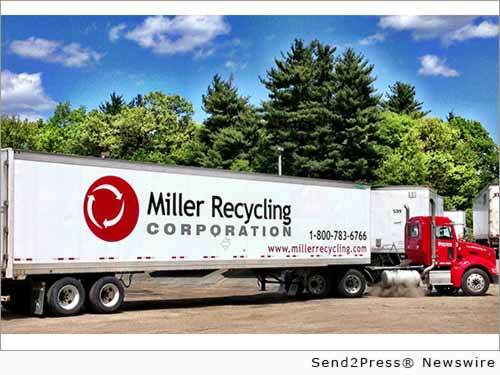 MANSFIELD, Mass., Nov. 14, 2014 (SEND2PRESS NEWSWIRE) — Miller Recycling Corporation celebrates America Recycles Day today by applauding all individuals who make a strong effort to recycle as part of daily life, and encouraging all to learn more about recycling and the industry. America Recycles Day, started in 1997, takes place every November 15 in a nationwide effort to promote and celebrate recycling in the U.S.
“With a history of 75-plus years in this industry, we are proud to take part in America Recycles Day, which recognizes the importance of our business. Recycling is such a vital component in the health of both the environment and U.S. economy. We hope generations to come continue to realize the importance of recycling, and continue to advance the industry as a whole,” said Randy S. Miller, President of Miller Recycling. “Having operated in Massachusetts as a family owned company for 4 generations, our 25 employees process paper, metals, plastics, and electronics. Our services contribute to the collection and recycling of over 50,000 tons per year of material. Not only do these actions assist with conserving the environment, but also avoid wasting our costly natural resources. All processing is performed at our Solar Powered recycling facility – located in Mansfield, Massachusetts. Our 300Kw solar installation provides the company with up to 70 percent of its electrical power needs,” said Randy. According to the ISRI Scrap Yearbook 2014, in 2013, U.S. scrap recyclers processed more than 130 million tons of scrap metal, paper, plastics, electronics, textiles, glass and rubber, creating significant energy savings, reducing greenhouse gas emissions, saving natural resources and limiting the amount of material that would otherwise be sent to landfills. In addition to these critical environmental benefits, the scrap recycling industry also provides much-needed support to our economy and trade balance. In 2013 alone, the United States exported 42.8 million metric tons of scrap commodities valued at $23.7 billion to 160 countries around the world. Here at home, independent research conducted by John Dunham & Associates confirms that the scrap recycling industry directly and indirectly supports nearly 463,000 good paying jobs while generating more than $87 billion in economic activity and $10.3 billion in federal, state and local tax revenue. Miller Recycling Corporation is a member of ISRI, the Voice of the Recycling Industry™. ISRI represents more than 1,600 manufacturers and processors, brokers and industrial consumers of scrap commodities, including ferrous and nonferrous metals, paper, electronics, rubber, plastics, glass and textiles. Miller Recycling Corporation, 73 Plymouth Street, Mansfield, MA 02048. Original Keywords: Solar Powered recycling facility, Institute of Scrap Recycling Industries, ISRI Miller Recycling Corporation Mansfield Massachusetts MANSFIELD, Mass. Alternate Headline: America Recycles Day 2014 promotes and celebrates recycling in the U.S.
REFERENCES: Environment and Ecology News, Solar Powered recycling facility, Institute of Scrap Recycling Industries, ISRI Miller Recycling Corporation Mansfield Massachusetts MANSFIELD, Mass.